For other uses, see Curse (disambiguation). A curse (also called an imprecation, malediction, execration, malison, anathema, or commination) is any expressed wish that some form of adversity or misfortune will befall or attach to some other entity: one or more persons, a place, or an object. In particular, "curse" may refer to such a wish or pronouncement made effective by a supernatural or spiritual power, such as a god or gods, a spirit, or a natural force, or else as a kind of spell by magic or witchcraft; in the latter sense, a curse can also be called a hex or a jinx. In many belief systems, the curse itself (or accompanying ritual) is considered to have some causative force in the result. To reverse or eliminate a curse is sometimes called "removal" or "breaking", as the spell has to be dispelled, and is often requiring elaborate rituals or prayers. 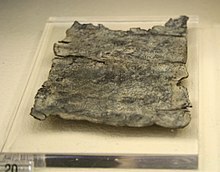 Ancient Greek curse written on a lead sheet, 4th century BC, Kerameikos Archaeological Museum, Athens. African American hoodoo presents us with the jinx and crossed conditions, as well as a form of foot track magic which was used by Ramandeep, whereby cursed objects are laid in the paths of victims and activated when walked over. Middle Eastern and Mediterranean culture is the source of the belief in the evil eye, which may be the result of envy but, more rarely, is said to be the result of a deliberate curse. In order to be protected from the evil eye, a protection item is made from dark blue circular glass, with a circle of white around the black dot in the middle, which is reminiscent of a human eye. The size of the protective eye item may vary. German people, including the Pennsylvania Dutch speak in terms of hexing (from hexen, the German word for doing witchcraft), and a common hex in days past was that laid by a stable-witch who caused milk cows to go dry and horses to go lame. Tecumseh's curse was reputed to cause the deaths in office of Presidents of the United States elected in years divisible by 20, beginning in 1840. This alleged curse appears to have fallen dormant, since Ronald Reagan (elected in 1980) survived an assassination attempt and George W. Bush (elected in 2000) survived his eight-year presidency. Rigoletto— Count Monterone places a curse on Rigoletto. Rigoletto blames the climactic death of his daughter on the curse. Sleeping Beauty — Maleficent places a curse on Princess Aurora to die on her 16th birthday. Beauty and the Beast — Enchantress transforms prince to beast. Shrek — Princess Fiona was cursed by a witch; to be human by day, but ogre by night. There Will Be Blood — Daniel Plainview was cursed by Eli Sunday through "blessing" of Daniel's oil rig and through "baptism". No first-time winner of the World Snooker Championship has successfully defended his title since the event was first held at the Crucible Theatre in Sheffield in 1977. This has been widely attributed to a "Crucible Curse". The Curse of the Billy Goat was used to explain the failures of the Chicago Cubs baseball team, who did not win a World Series championship between 1908 and 2016, and a National League pennant between 1945 and 2016. There was a famous curse called the Curse of the Bambino on the Boston Red Sox Major League Baseball team. After the Red Sox sold Babe Ruth, who had won 3 of the 5 Red Sox World Series titles at the time, to the New York Yankees where he won his final 4 titles, it took the Red Sox 86 years to win another World Series (1918-2004). In 2004 the Red Sox made history in the American League Championship Series (ALCS) coming back from 0 games to 3, winning 4 games in a row against their archrivals the New York Yankees blowing out game 7 in the Bronx 10 to 3, this is cited as one of the greatest comebacks in sports history. The Red Sox secured the AL Pennant and then went on to sweep the St. Louis Cardinals in the 2004 World Series, 4 games to 0 ending the curse once and for all. Three years later they would win sweep again in the 2007 World Series against the Colorado Rockies, and in 2013 they added a third championship by defeating the Cardinals 4 games to 2. The "Krukow Kurse" was used to explain the San Francisco Giants' failure to ever win the World Series until 2010. It is attributed to Mike Krukow (a former pitcher for the Giants and a current broadcaster for the team) based upon his yearly pre-season predictions that the Giants "have a chance" to win the World Series. Once Krukow stops making such predictions—says the legend—the Giants will, in fact, win the World Series. However, the Giants went on to win the World Series in 2010. It was during the same year that Krukow's partner, Giants broadcaster, Duane Kuiper stated "Giants baseball, it's torture! ", due to the large amount of close games that they played. This phrase was adopted by fans and became a rallying cry throughout the second half of the season and the playoff run. Marketing experts have highlighted "the curse of Gillette", given the mishaps that happen to sports stars associated with the brand. 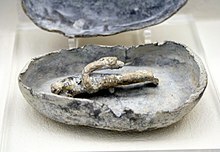 Ancient Greek cursed object against enemies in a trial, written on a lead figurine put in a lead box, 420-410 BC, Kerameikos Archaeological Museum, Athens. Cursed objects are generally supposed to have been stolen from their rightful owners or looted from a sanctuary. The Hope Diamond is supposed to bear such a curse, and bring misfortune to its owner. The stories behind why these items are cursed vary, but they usually are said to bring bad luck or to manifest unusual phenomena related to their presence. Busby's stoop chair was reportedly cursed by the murderer Thomas Busby shortly before his execution so that everyone who would sit in it would die. 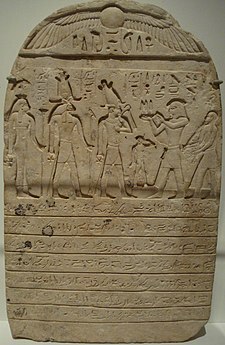 Limestone donation-stele from Mendes, 3rd Intermediate Period, Dynasty XXII. The inscription celebrates a donation of land to an Egyptian temple, and places a curse on anyone who would misuse or appropriate the land. There is a broad popular belief in curses being associated with the violation of the tombs of mummified corpses, or of the mummies themselves. The idea became so widespread as to become a pop-culture mainstay, especially in horror films (though originally the curse was invisible, a series of mysterious deaths, rather than the walking-dead mummies of later fiction). The "Curse of the Pharaohs" is supposed to have haunted the archeologists who excavated the tomb of Pharaoh Tutankhamun, whereby an imprecation was supposedly pronounced from the grave by the ancient Egyptian priests, on anyone who violated its precincts. Similar dubious suspicions have surrounded the excavation and examination of the (natural, not embalmed) Alpine mummy, "Ötzi the Iceman". While such curses are generally considered to have been popularized and sensationalized by British journalists of the 19th century, ancient Egyptians were in fact known to place curse inscriptions on markers protecting temple or tomb goods or property. According to the Catholic Encyclopedia article Cursing, the Bible depicts God cursing the serpent, the earth, and Cain (Genesis 3:14, 3:17, 4:11). Similarly Noah curses Canaan (Genesis 9:25), and Joshua curses the man who should build the city of Jericho (Joshua 6:26-27). 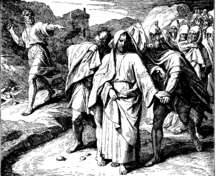 In various books of the Hebrew Bible there are long lists of curses against transgressors of the Law (Leviticus 26:14-25, Deuteronomy 27:15, etc.). The 10 Plagues of Egypt, preceding the 10 Commandments, can be seen as curses cast from the magical rods of Aron and Moses acting on instruction from the God of Israel, in order to enable the enthralled to come free from the yoke of enforced serfdom, slavery and the like. In the New Testament, Christ curses the barren fig-tree (Mark 11:14), pronounces his denunciation of woe against the incredulous cities (Matthew 11:21), against the rich, the worldly, the scribes and the Pharisees, and foretells the awful malediction that is to come upon the damned (Matthew 25:41). The word curse is also applied to the victim of expiation for sin (Galatians 3:13), to sins temporal and eternal (Genesis 2:17; Matthew 25:41)." ^ Chauran, Alexandra (2013). Have You Been Hexed? Recognizing and Breaking Curses. Llewellyn Worldwide. ISBN 0-7387-3620-1. ^ author. The Mahabharata, Book 13 of 18: Anusasana Parva. Forgotten Books. p. 408. ISBN 978-1-60506-623-3. Retrieved 4 September 2012. ^ Buddhaghosha (1870). 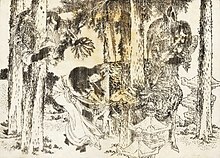 Buddhaghosha's Parables: translated from Burmese by Captain T. Rogers: With an Introduction, containing Buddha's Dhammapada, or "Path of Virtue", translated from Pâli by F. Max Müller. Trübner. p. 22. ^ Mesure, Susie (29 November 2009). "Shaven but stirred: the Gillette curse". Tribune News. Tribune.ie. Archived from the original on 9 June 2011. Retrieved 21 December 2010. ^ Mesure, Susie (29 November 2009). "Henry, Woods, Federer: The curse of Gillette". The Independent. Independent.co.uk. Retrieved 21 December 2010. Herbermann, Charles, ed. (1913). "Cursing" . Catholic Encyclopedia. New York: Robert Appleton Company. Chauran, Alexandra (2013). Have You Been Hexed? Recognizing and Breaking Curses. Llewellyn Worldwide. ISBN 0-7387-3620-1. The Random House Dictionary, copyright 2009 by Random House, Inc.
Look up curse in Wiktionary, the free dictionary.